Sol and Rachel do a Blog: Fact or Fiction? BAM. Courtney. WHAT A ZINGER. Also, it looks like the day Brady was born and I was walking with him in the hospital. I love it. Brilliant idea. You know how Dad used to tell us "That's how your older brother died!" to keep us from doing stupid stuff? You should show Finley this picture, and convince him that he had a twin brother who did lots of good things, so he got to live in the White House. This is a great idea. I think it will be highly motivating! 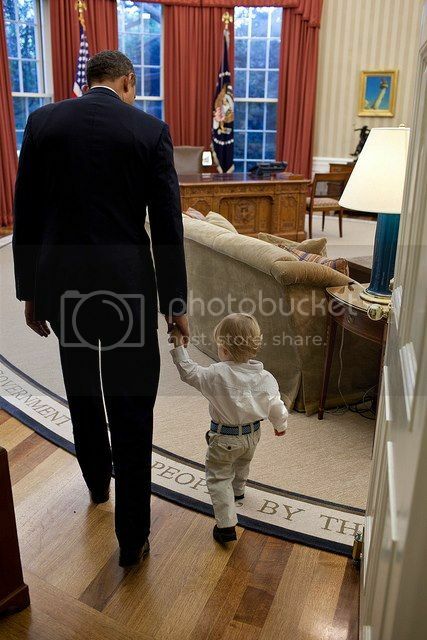 What do you think Finley's telling the President? Something about "Up," maybe? Or his awesome mama? Isn't the White House photographer a K-Stater? Maybe he's responsible for sneaking Finn in there? The WH photog is a K-Stater? I had no idea! That's incredible.